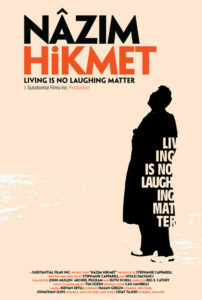 Documentary on the life of the great Turkish poet Nazim Hikmet; length: 86 min. ; shot in 16 mm film and in video in Turkey, Russia, France, U.S. and the U.K. 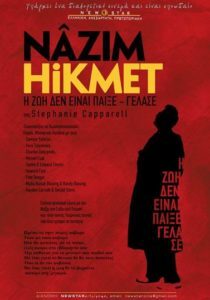 The story of Nazim, as he was known, is a powerful tale of what one person will sacrifice for his art and what one individual’s participation means to the universal struggle for freedom. 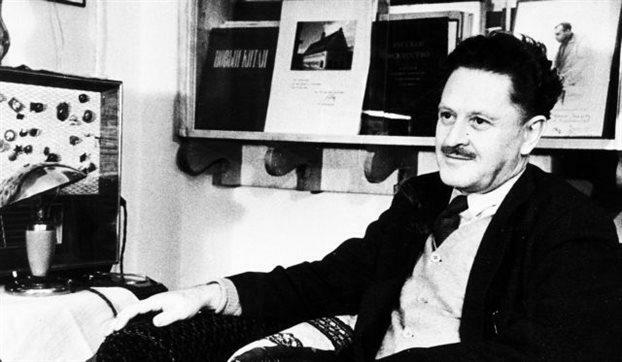 Howard Fast, who protested the poet’s incarceration before Fast himself was sent to prison by HUAC in the U.S.
Nazim was born Jan. 15, 1902, into an Istanbul family of intellectuals, the grandson of a pasha-poet and a descendant of a Polish revolutionary and a Huguenot. He began publishing poetry by the age of 17. In the 1920s, he was drawn to Russia, where he became dedicated to the humanist ideals of the new “experiment.” His travels there, and the populist ideals in his writing, led to several incarcerations in Turkey. Even after his death, the Turkish government refused to recognize him for decades. That is because he was also one of the first prisoners of conscience in Turkey, jailed for nearly two decades for his political beliefs. His only weapon was his art. His message was of the common pursuit of love, justice and decency—and wrote in verse as beautiful as any ever written in any language. He also was an accomplished playwright and painter. His moving and articulate voice for peace, hope, brotherhood and struggle is particularly poignant today. In 1938, Nazim was sentenced, without any evidence but the weight of his poetry, to 28 years in prison on two charges of inciting the army and the navy to rebellion. He was released under a special amnesty law in 1950 and escaped to the Soviet Union a year later, fearing for his life. Nazim not only survived his ordeal, but left prison a more accomplished poet, more full of love for his people and even more devoted to human rights. 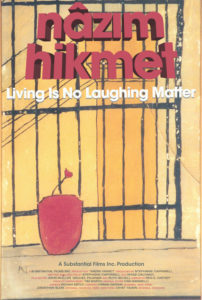 One of the film’s interviews is with a former inmate, Ibrahim Balaban, whom Nazim helped become a noted painter in Turkey. More than a decade into his last prison sentence, Nazim’s suffering became an international cause celebre, with artists such as Paul Robeson, Jean-Paul Sartre, Pablo Neruda, Pablo Picasso and Bertold Brecht joining a Free Nazim campaign. In 1949, he shared the World Peace Prize with Neruda and Picasso. Nazim was finally freed in June 1950, suffering from heart, lung and liver disorders he developed in prison. He was then drafted into the army—at the age of 49. Fearing for his life, he fled to Russia with the help of his brother-in-law, Refik Erduran, who describes in the documentary the daring escape. In the film, his last wife, Vera Toulyakova, reveals how his struggle continued in the Soviet Union, where several of his plays—scathing satires of Russian bureaucracy—were silenced. 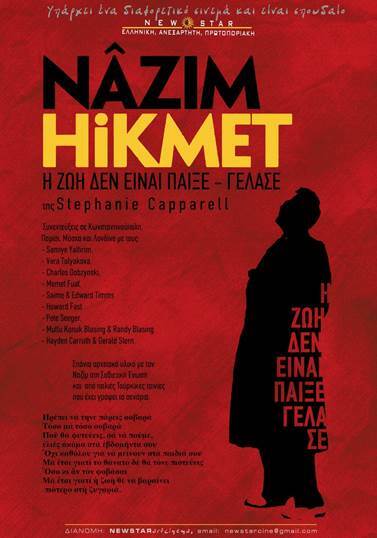 The film shows rare footage of Nazim in Russia as well as clips from old Turkish movies for which Nazim wrote screenplays that are rarely shown. It also will present materials gathered outside Turkey that were made public for the first time. 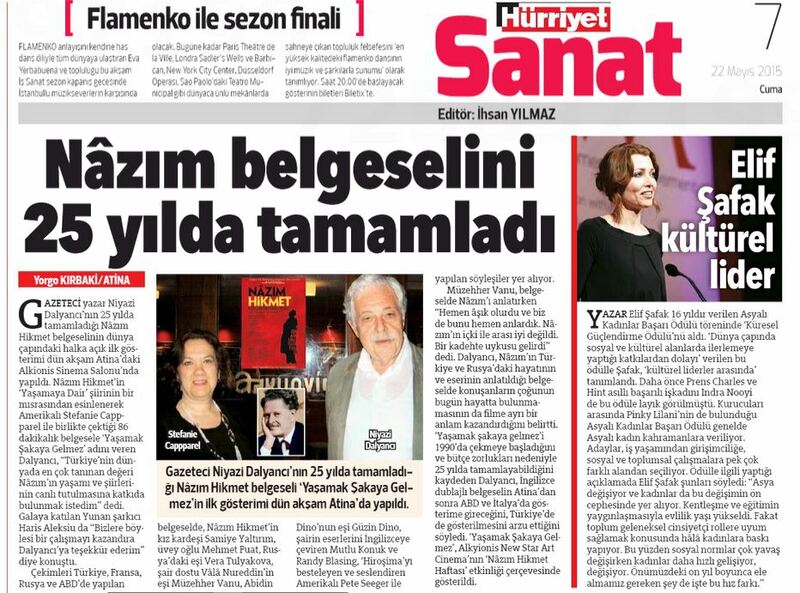 Interviews filmed in Istanbul, Paris, Moscow and London include Nazim’s sister, Samiye Yaltirim; his last spouse, Vera Tulyakova; his friend, the French poet Charles Dobzynski; Memet Fuat, the poet’s stepson and editor of his collected works; Nazim biographers Saime and Edward Timms; and some of Nazim’s critics. In the U.S., interviews include writer Howard Fast, who demonstrated in New York against Nazim’s incarceration before being sent to prison himself as a result of the hearings of the House Committee on Un-American Activities; legendary singer Pete Seeger; Mutlu Konuk and Randy Blasing, a Brown University professor and a poet, respectively, who have compiled a superlative series of translations in English of Nazim’s work; and poets Hayden Carruth and Gerald Stern. Η περιπέτειά μου άρχισε / μια νύχτα που το χιόνι έφτανε ως τα γόνατα, / με τράβηξαν απ’ το τραπέζι του δείπνου, / με πέταξαν σ’ ένα περιπολικό, / με πακετάρισαν σ’ ένα τρένο / και μ’ έκλεισαν σ’ ένα δωμάτιο. / Εδώ και τρεις μέρες συμπληρώθηκαν εννιά χρόνια. 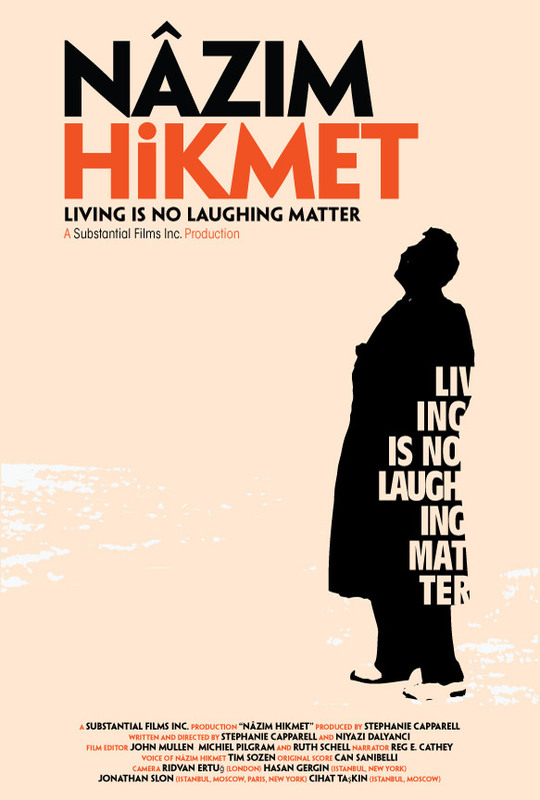 Help support our effort to bring “Nazim Hikmet: Living Is No Laughing Matter” to theaters in New York City and to Italy. All proceeds will go toward renting a local venue and to subtitling the documentary in Italian. All levels of support are greatly appreciated. Those who donate $180 or more will receive as a gift one of the beautiful and notorious Ethnic Maps of 1919, described below. 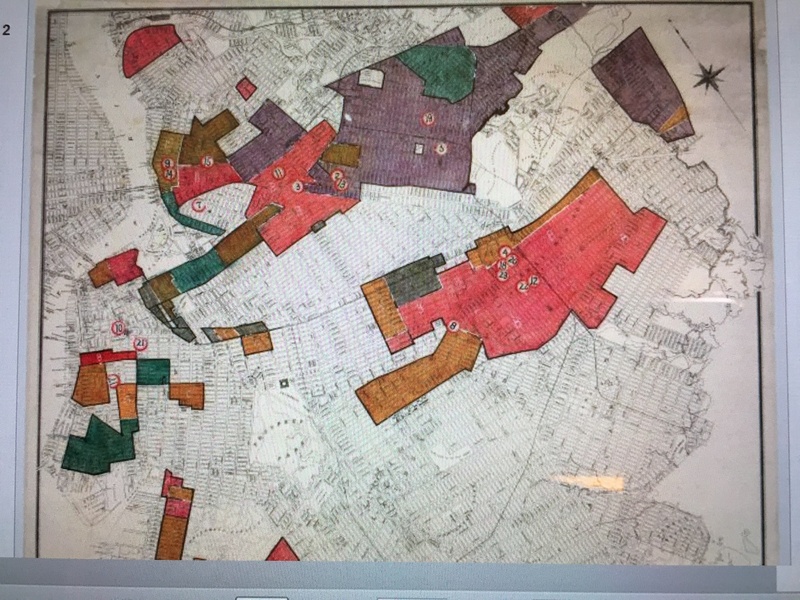 The U.S. government—terrified of the worldwide rise of the Left and fearful of its own citizens, especially New Yorkers and especially foreign-born ones—worked with local police to create a map of Manhattan and a map of and Queens in 1919 that identified ethnic groups and their publications and meeting places. The anti-sedition campaign was later discredited as un-American. But the map survives as a work of art, and an unintentional tribute to the city’s diversity, its once-thriving local press and its activist tradition. Nazim (1902-1963) dedicated his life and his art to defending human rights, peace and freedom. He committed no crime other than to write poetry of power and beauty. He faced bans on his work and travel in the U.S.S.R., the U.S.A. and Turkey in his lifetime. It’s a voice we must hear today. 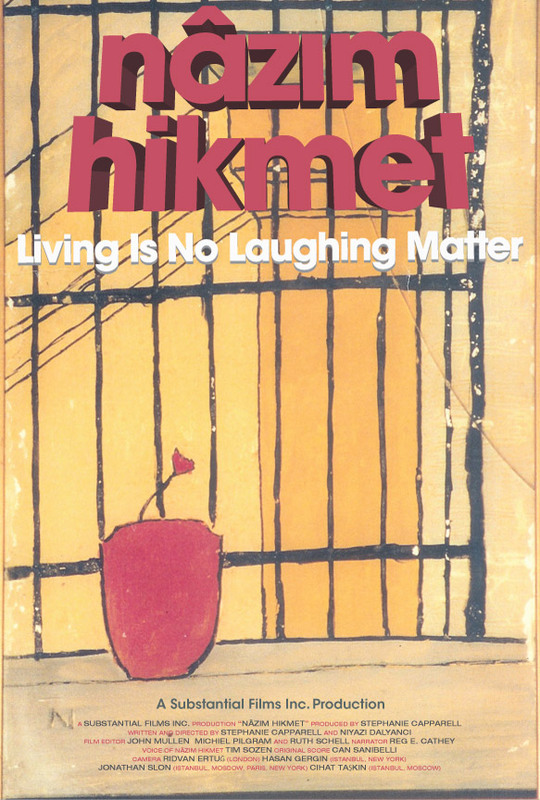 “Hikmet must never die!” Sartre declared.